Mayor Bill de Blasio released the city's $74 billion budget, the first of his administration, on May 8, 2014. 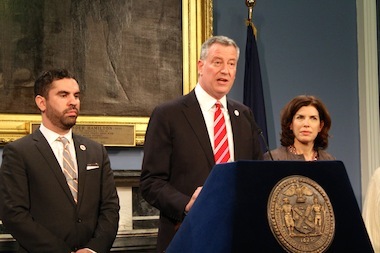 CIVIC CENTER — Mayor Bill de Blasio released his first, $73.9 billion city budget on Thursday, promising to be progressive, honest and fiscally responsible. The budget highlights the administration’s priorities, including the $300 million expansion of universal pre-kindergarten and after-school programs for middle school students, and the 10-year, $5.5 billion contract deal with the city’s teachers. However, budget gaps remain, according to the mayor’s office, despite previous Mayor Michael Bloomberg's claim to have left the city with a balanced budget for the first time. The gaps are projected to start at $2.2 billion in 2016 and rise to $3.2 billion in 2018. However, the administration was quick to say these deficits were “well below” historical averages for a new administration, which have historically seen gaps of close to $4 billion. The budget includes a three-year $110 million rehabilitation program for the city's police precincts, including the construction of a new facility in the South Bronx's 40th Precinct. However, the budget does not include the City Council’s request to hire 1,000 new police officers. In a statement, City Council Speaker Melissa Mark-Viverito said the lack of new hires was "disappointing," but she praised the budget overall as a "strong start" for the mayor. The budget also contains additional funding for city schools to reduce overcrowding and the use of trailers, plus a $20 million boost for arts education. The city will expand after-school programs by 100,000 seats using $145 million from the state. That is about 19,000 seats fewer than de Blasio had hoped to add, because the state funding fell about $45 million short of what he had requested. Officials said they expect to receive the full $190 million next year, which will allow for the full expansion of after-school. CUNY will receive a $20 million increase in funding to strengthen its science, technology, engineering and math programs. Funding for the New York City Housing Authority will increase by $122.5 million to begin addressing the extensive repair backlog, and to increase security throughout the public housing system. The mayor’s Vision Zero goal of eliminating traffic fatalities is set to receive considerable funding as well. The Department of Transportation will see a $28.8 million increase, which includes funding for 50 speed bumps near schools, the development of new slow zones, speed cameras and the redesign of dangerous intersections. Additionally, the NYPD will see a $13 million increase for traffic enforcement. The administration also followed up on de Blasio's pledge to reduce the city's reliance on fines from small businesses. Penalty revenue is projected to decline by 8.1 percent from 2012, based on a 44 percent drop in Department of Health fines and a 21 percent decrease in the Department of Consumer Affairs fines.